It is backstroke showdown round 2 for 16-year-old studs Phoebe Bacon and Isabelle Stadden, this time in the 100 back. Bacon took the top spot from this morning, with Stadden joining Bacon in the 52-second range. 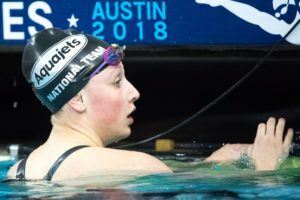 The duo come in with the #2 and #3 fastest 100 back times in the 15-16 age group, and with Regan Smith now 17 years old, taking down her 50.58 NAG could mean more than the title. Behind the battle is third seed qualifier Elmbrook’s Reilly Tiltmann, who is also joined by her Wisconsin-teammate Kaylyn Schoof. Both swimmers’ PBs are under the senior national cut of 53.29, but could ride the waves of Bacon/Stadden and join them in 15-16 history. Versatile sprinter Anthony Grimm is spotted at the top once again at the NCSA meet, this time showing off his backstroke strengths. Grimm cruised to a 47.52 top prelims time, however, has gone 46.63 to rank #4 all-time in the 15-16 age group. Tonight, Grimm could add a 4th victory to his meet performance and potentially have a shot at the NAG of 45.66. Behind the 16-year-old are 17-18 swimmers Aidan Stoffle and 200 free champ Jack Dolan. The other 16-year-old in the A final is Nathaniel Stoffle (48.46), relative of Aidan, from Summit Swimming. Touching in the top spot for the 500 free A-final tonight is 1000 free champ Paige McKenna of NCAP. Right behind her is 400 IM champ Grace Sheble and IL record-holder Rachel Stege. 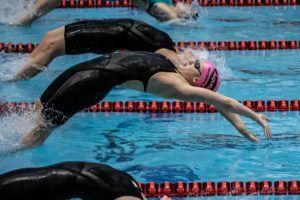 All three swimmers finished within two-tenths of each other, and if things shake out as they appear, the trio could have a thrilling battle throughout the 500-yard race. Both McKenna and Stege have been 4:44 in their careers, and so has #4 seed Rachel Klinker of Lexington Dolphins. Klinker cruised to a 4:48.15 in prelims, so be sure to watch her in tonight’s final too. Peter Larson and Kimani Gregory take the top 2 spots in the 100 free A-final tonight. 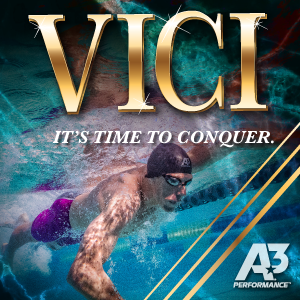 Both swimmers have been 43-mid in their careers, so expect sub-44 swims from them. In his second A-final of the night, Jack Dolan is another sub-44 swimmer, who cruised to a #4 seed of 44.72. In the third seed is Luke Maurer, who finished 3rd in the 200 free to Dolan on Thursday. Maurer and the rest of the top 8 were all sub-45 in this event. Looking for another breaststroke title is Anna Keating of Machine Aquatics. On Wednesday, Keating swam the 4th-fastest 100 breast in the 15-16 age group with a 59.04. Today, Keating has a shot once again of cracking the top-1o times in the 200 breast. While cruising to a 2:12.21, Keating’s PB of 2:09.63 came from last year’s NCSA meet, which is #11 in the ranks. Sitting behind Keating in the top 3 are Meghan Lynch, who was just one second off her PB, and Reese Dehen, dropping a second from her PB. 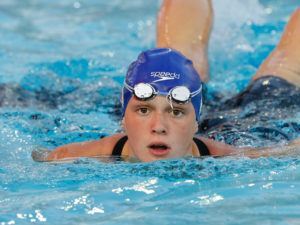 Among the rest of the A-final is 14-year-old Kaelyn Gridley of New Trier Aquatics. 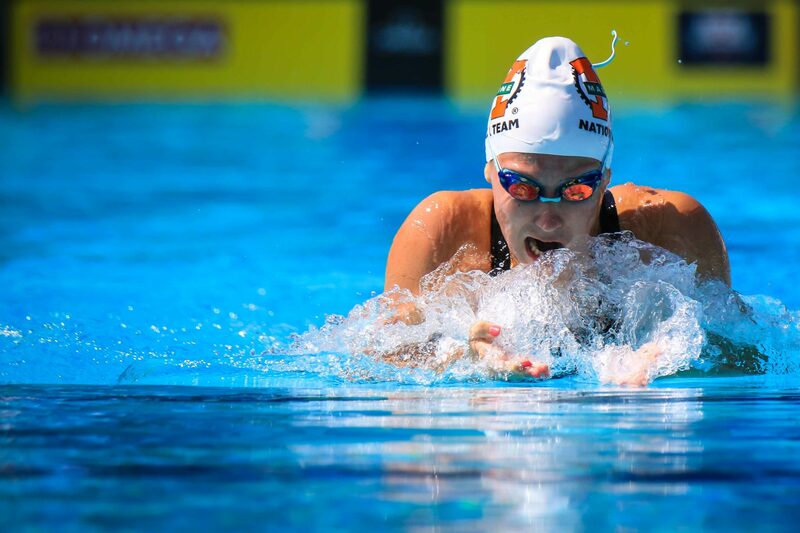 Gridley swam 2:14.77 to place 7th in prelims, however, she has been 2:14.00 in her career, #24 in the 13-14 ranks. 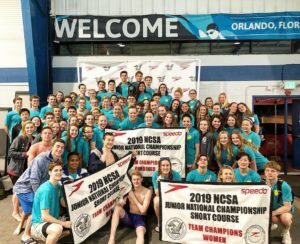 With the rest of the field stacked up very close with each other, Gridley could join the few swimmers at this meet making age group history. With no Grimm in the field, Joshua Matheny now has a clear shot of gaining a breaststroke win after placing top 3 in the 50/100 breast. Matheny cruised to the top spot with a 1:56.86, yet has the 5th-fastest 200 breast time ever with a 1:55.27. For quick reference, the 15-16 NAG is 1:52.37 while #2 is 1:54.87, both of which Matheny could have the drive to achieve. Coming in sub-2:00 as well are Jason Louser, Dylan Rhee, and #4 seed Bernhard Christianson (1:58.62). Also in the A-final tonight is 50 breast runner-up William Myhre. While making the final with a 2:00.30, Myhre’s PB is 1:57.37. Expect Myhre and Matheny to face-off again as both swimmers were runner-ups to Grimm in the previous breaststroke swims. Abigail Harter has a shot at taking another butterfly win tonight, cutting the distance in half for the 100 fly. 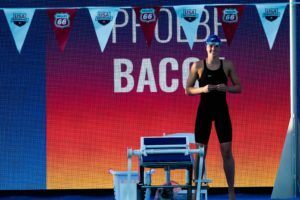 While her prelims swim was nearly a second faster than top 3 seeds Talia Bates and Alexa Cuomo, both swimmers have been sub-53 in their careers as well. Phoebe Bacon is another contender in the field, who swam 53.81 for the #6 seed but also has been sub-53 before. Lurking in the B-final is 14-year-old Tess Howley of Long Island Aquatics, who broke the 13-14 NAG in the 200 fly on Wednesday. 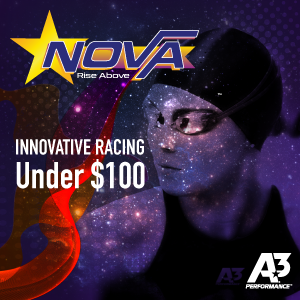 While Howley’s PB is 54.43 and out of the top-10, she has a chance at making more history if she were to continue her momentum from her 200 fly NAG. Anthony Grimm is back, this time flipping onto the 100 fly. Grimm shaved just 0.03 off his PB to maintain his 17th-fastest 100 fly time in the 15-16 age group. With the meet Grimm has been having, a sub-47 swim could be within his reach. Timothy Marski could look for another runner-up swim tonight after taking 2nd in the 200 fly on Wednesday. Yet coming back for another A-final swim is Kimani Gregory, who will be in the 100 free A-final as well. Todd DeSorbo needs to start mowing the lawn & weeding the garden for Mrs. Grimm. Maybe clean the gutters & power wash the shutters every spring too just to be sure. Ant reason given why Tori Huske DQed in 100 Fly?